Just as most of the public has repressed events from 16 years ago when terrorists attacked and laid waste to the World Trade Centers back on 9/11, so too it appears they have forgotten what took place in their portfolios following the 2008 financial crash. This is because nearly 10 years after ‘promising’ never to touch the stock markets again after their wealth and retirement accounts were downsized between 40-60% from 2009-10, it appears that greed has overcome prudence and Mom and Pop average Joe investors are now back into equities at levels not seen since the Dot Com bubble. 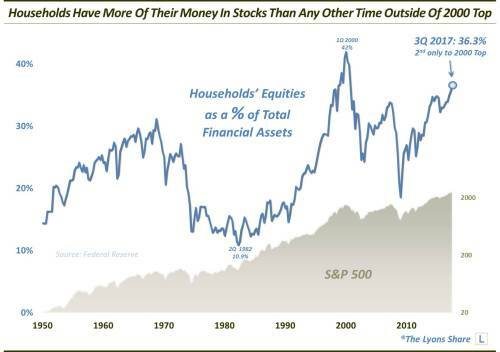 The percentage of households’ financial assets currently invested in stocks has jumped to levels exceeded only by the 2000 bubble. The saddest part of this scenario is that just as like in 1996 and 2004 when the stock markets were just beginning their record runs to new all-time highs, most retail investors did not get in until the momentum and mania were already well under way, meaning that household’s dabbling in equities were buying companies that were either already overvalued, or that the sector was within just a few years of crashing due to what always takes place at the end of a bubble. The recipe is almost always the same in these bubble cycles… institutions are able to get cheap money to buy stocks when they reach the bottom of a bear market while the psychology of severe losses are fresh in the minds of the general public. Then when stock prices continue to rise year over year, surpassing previous highs and gaining new all-time ones, it is then that the very same investors who swore never again that they would get burned fall into the trap, and become once again the bag holders for the institutions who are getting ready to sell as the cycle turns to the downside.